This three-part series of pages helps you consider the topics that will help your organization succeed in the long run, including orderly meetings and finances that don't alienate people, handling conflict, balancing between negative and positive emphases, and selecting meaningful projects wisely. When you're full of enthusiasm, it's a challenge to hold some of that in reserve for tougher times, but that's exactly what is called for if you want a viable neighborhood association over many years. Be sure that the meetings are orderly. Be clear about who will preside over the meeting. The presiding person needs to encourage only one person speaking at a time, discourage side conversations, indicate some likely flow of the meeting, and politely interrupt people who talk too long. The chairperson also should command enough respect to call an end to unproductive discussions by postponing them to a future time, simply saying that enough discussion has occurred and calling for a vote, or assigning the matter to a committee. It is useful to prepare an agenda for each meeting. It gives the president a bit of permission to gently move the meeting back on course if topics not ripe for discussion or decision making are wasting time. Almost every neighborhood association includes at least one chronic complainer, and it is fairly common to have a person who becomes a real pest in trying to make the same point over and over, or who gripes about every possible neighborhood nuisance. The most important point about an agenda is to try to set up a correct expectation about whether something on the list is an action item where a decision is expected, a discussion, or a brainstorming. Select verbs that say what you mean. For instance, be clear about whether this agenda item is a discussion of a recurring issue, a brainstorm about a new problem or opportunity, or an item where a decision or motion is essential. Some agenda item may be recurring at almost every meeting. Examples are reports from elected officials, city departments, committees, and block units. 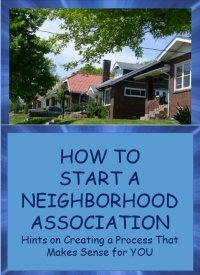 If you are trying to start a neighborhood association, we offer a separate series of pages specific to that not-so-small project. You will want to understand most of the information in this series of pages right away as well, but the most basic facts and techniques about organizing are found in the other series. Our new e-book summarizes and re-states what you need to know to get started, but also contains examples and information on temporary organizations not available anywhere on the website. A successful neighborhood organization sets up a delicate balance between a real problem and hope for a solution. We prefer an asset-based community development approach in most settings and situations, although we have to admit that focus on one specific broad or narrow problem helps a neighborhood organization get started. Although realistic hope is important, don't underestimate the extent of real threats and problems. Pay attention to the opinion of professionals in urban issues, community development, housing, rural development, or whatever is appropriate in your case. If they are pessimistic about your chances, ask "why" to every negative assertion they make. Just as individuals often defy the odds, so do communities. The best community associations work steadily toward a membership with a sophisticated understanding of cause and effect in issue areas most important to the neighborhood. A nuanced understanding increases patience with difficult neighborhood problems, while at the same time reducing tolerance of complaints that should be easily resolved. When you refuse to allow elected officials, utilities, and districts to get by with annoying you unnecessarily, but at the same time show empathy when they face big challenges themselves, you really increase your credibility. If you collect dues or donations, spend them productively. You should have a written budget, whether you are strict about observing your budget or regard it only as a guideline or spending plan. In the beginning, you can have the membership vote on all or most expenditures before you adopt a formal budget. In some states, a budget is a required submittal with incorporation papers. Just because you have a budget doesn't mean you have to have numerous categories. Five or six line items often will be enough to reassure any inquiring neighbors about what you're really doing with the money. On the other hand, include all the line items you would really like to track. Usually when finances become predictable, officers are allowed to make spending decisions for small amounts of money. A computer accounting program is a great boon if you have access to one without paying "an arm and a leg," as we say in the U.S. The program will help you track your actual performance in comparison with the budget. Even if you do your accounting manually, you will need to report to the board and members how your actual receipts and expenditures are tracking against the budget. Somewhere either in the process of figuring out officers, membership, by-laws, and incorporation for new neighborhood associations, or when you reach a comfortable level of maturity, if your neighborhood association includes members of the business community, someone surely will suggest that the group needs a formal mission statement or vision statement, or both. Some experts try to distinguish between a mission statement and a vision statement, but for neighborhood associations, it isn't worth the effort to argue with someone who has a strong preference for which one you have, and strong ideas about which is which. Nevertheless, a good galvanizing statement is one that is specific about what is to be done and when. For example, a famous mission statement was "to put a man on the moon in this decade and return him safely to the earth." Instead of worrying so much about one mission statement for all circumstances and all time, you might want to keep a limited goal statement in front of you, such as "to reduce violent crime by two-thirds in the next two years" or "to convince City Hall within the next year to install a rain garden in every block." 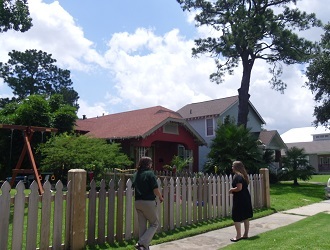 An organization of neighborhood associations in the U.S. is Neighborhoods USA. A premiere organization that offers excellent training to both member and non-member group representatives is NeighborWorks(R) America. Excellent training and programs about community dialogue are available through Everyday Democracy. Keep checking our website too. Resources for neighborhood associations are growing quickly. Leaders should look at our pages on nonprofit board development and what is called SWOT analysis or strategic planning. We have compiled a handy list of the neighborhood topics across all sections of the website, but in addition, you should use the Search box to find articles about particular topics that are timely for you. Please continue on with parts 2 (conflict resolution) and 3 (project selection) of this article on neighborhood associations, reached from the buttons below.